Where in Wellington do you find a hermit’s island, fishing boats, rockpools, a pirate ship, a haunted house, a treasure trove of books, dolphins, seals and penguins, fish and chips and ice-cream? In Island Bay of course. That’s why it’s such a great place for kids. With flocks of seabirds wheeling above its rocky peaks, waves pounding its seaboard side and cut from the mainland by a narrow but treacherous looking channel, Tapu Te Ranga, Island Bay’s island, smacks of adventure. It was here, long ago, that the mysterious hermit of Island Bay lived with his goats. Long before that, the Tangata Whenua, or people of the area, took refuge here in times of war. Long, long before that, the legendary Kupe climbed its highest rock, to search for the octopus Te Wheke. Adventurers unable to resist the urge to explore Tapu Te Ranga are advised to be judicious in their choice of transport (reliable) weather (fine) and tide (definitely not outgoing) and to take water! 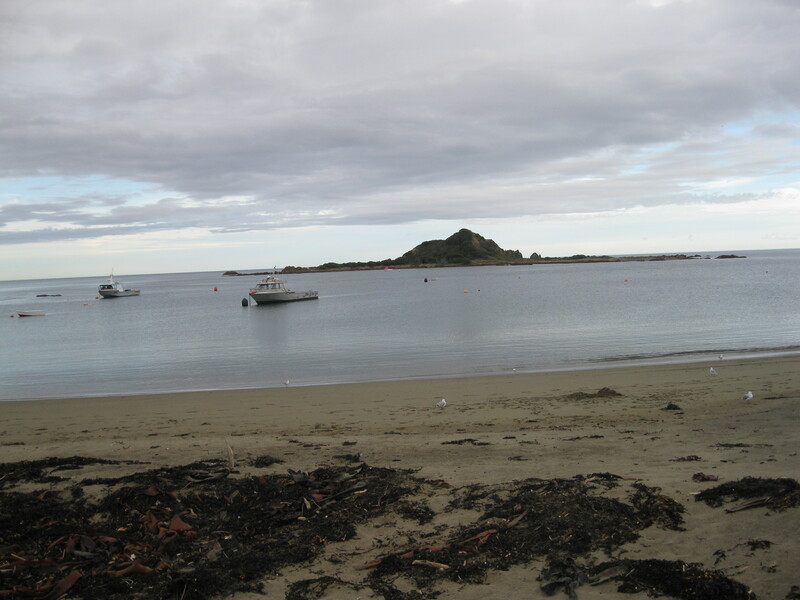 There are plenty of adventures to be had within sight of Tapu Te Ranga, on Island Bay beach – swimming, of course, sand construction projects, diving and bombing off the jetty, leaping around rocks and exploring rock pools. There’s also plenty to see, especially if you happen to be there when the fishing boats, followed by screeching seagulls, chug in from Cook Strait. The story of commercial fishing in Island Bay dates back to the late 1800s when fishermen from the Shetland Islands and from Southern Italy migrated here to fish the rich waters around here. Many of the descendants of those fishermen still live in Island Bay today and many of them are still in the fishing business. Island is often called little Italy and an important feature on the local calendar is the annual blessing of the fishing boats. Just over the road from Island Bay beach, Shorland Park’s pirate ship has fulfilled countless young adventurers’ Treasure Island and sea-faring fantasies for almost half a century. There’s a hillside slide, a paddling pool, a sandpit, a roundabout a band rotunda and lots of lawn to race around on when the pirate games have played out. When they have, it’s probably time for a little ghost spotting. The former Convent of the Sacred Heart, Erskine College, stands against the hills at the city end of Island Bay. It’s grim-faced grey, neo-gothic building. A creaking gate opens onto a shadowed garden of overgrown trees and thick shrubs. The air seems chilly. Rows of blank windows reflect the clouds. It’s the kind of place that fires the imagination with stories of ghosts. This probably why Peter Jackson chose to set his film The Frighteners here! 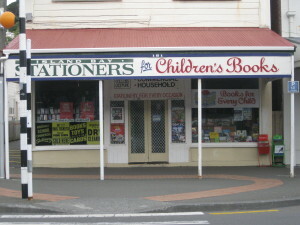 Back down in Island Bay’s main street, Island Bay Stationers, with its incredible collection of children’s literature, has been feeding young imaginations for over 40 years. Generations of children, including my own, remember hours happily browsing and choosing books with the kind and gentle assistance of Mrs Fay Far who established the collection. 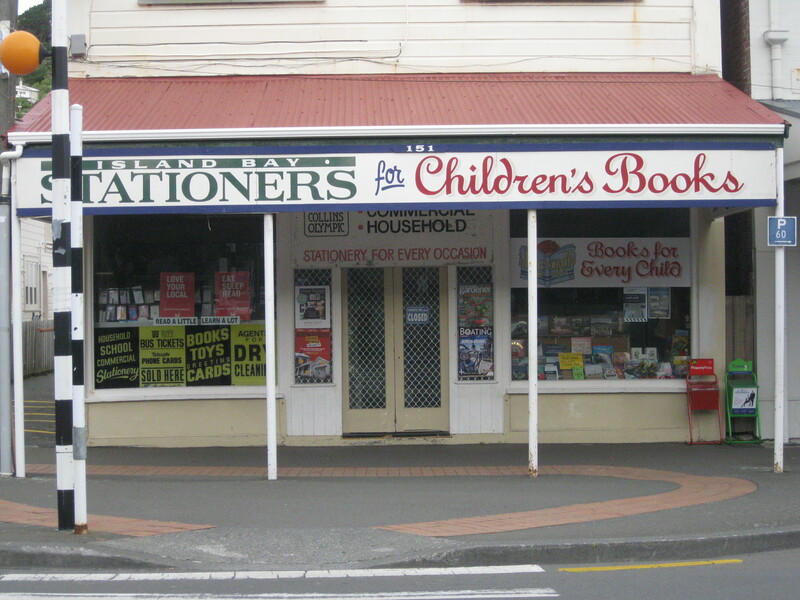 This Island Bay institution is still full of reading treasures – for kids and parents alike. Not strictly speaking, in Island Bay, but a bracing march over the hill and along the coast road, or a short drive of the same, you’ll find the Island Bay Marine Education Centre with a small aquarium and a touch tank – interesting stuff for budding marine biologists! Beyond this, you enter a marine reserve where all kinds of interesting sea creatures make their homes. It’s beautiful walk, with stunning views out to sea, where often, you’ll see the inter-island ferries sail past and if you’re lucky, dolphins cavorting in the waves, or, if you’re even luckier, you might catch a glimpse of a penguin. Further on still, on the windswept, sea-battered point where land ends, you’ll come to Red Rocks, home to a large colony of seals. Grandpas, grandmas, mums, dads, kids and baby seals lounge and play, chattering among themselves. It‘s fascinating to watch. The seals are quite untroubled by tourists and sightseers, until, of course, they get too close! To end a day at Island Bay, there’s nothing better than fish and chips on the beach, or in Shorland Park, with an ice-block for dessert. The best place to find those fish and chips is Island Bay Fish and Chips at 137 The Parade Island Bay. Right next door, there’s a dairy for the ice-blocks!